BURBANK, CA (April 25, 2014) - Angie Harmon (Law & Order) and Sasha Alexander (NCIS) are back as one of TV's favorite crime-fighting duos and ready to entertain viewers on DVD with Warner Bros. Home Entertainment's (WBHE) release of Rizzoli & Isles: The Complete Fourth Season , available June 10, 2014. Now fans can own all 16 thrilling episodes from the series' fourth season plus never-before-seen featurettes. 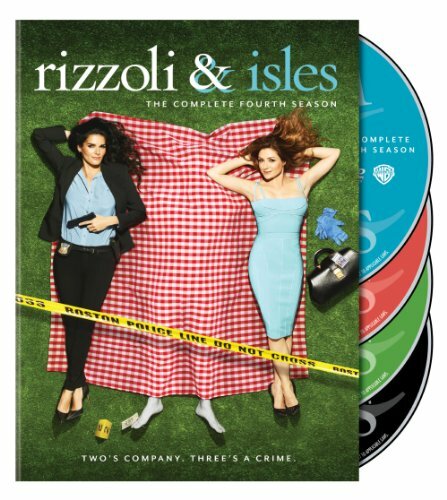 Rizzoli & Isles: The Complete Fourth Season will be released in time for the series' fifth season premiere on TNT. This DVD set will retail for $39.98 SRP. Based on the best-selling crime thriller books by Tess Gerritsen and developed by writer and former crime reporter Janet Tamaro (Bones, Lost), Rizzoli & Isles focuses on tough-as-nails Boston police detective Jane Rizzoli (Harmon), who has an uncompromisingly brash and beautiful bull-in-a-china shop approach to both cases and life, and the brilliant medical examiner from a privileged background, Dr. Maura Isles (Alexander), who may be the best-dressed science nerd in New England. Together they are close friends and complete opposites who solve some of Boston's most notorious crimes. As Rizzoli & Isles continues for a fourth explosive season, Jane and Maura investigate a number of complex and troublesome cases, including a deadly shooting at a community parade, the brutal killing of an overzealous journalism student and the pending murder trial of Maura's biological father, Paddy Doyle (guest star John Doman, Borgia). Amaury Nolasco (Prison Break) guest stars as Lt. Detective Rafael Martinez, the newly appointed head of the Boston Police Department's drug unit, who has a conflicted professional past with Jane, forcing her to relive a painful experience. Guest stars this season also include Chris Vance (Dexter, Burn Notice), Sharon Lawrence (NYPD Blue, Drop Dead Diva) and Colin Egglesfield (The Client List, Melrose Place). "Jane and Maura's relationship is fresh and fun, and viewers love them as a team. The unique way in which the two relate to one another is one of the reasons this series has become such a success," said Rosemary Markson, WBHE Senior Vice President, TV and Special Interest Marketing. She added, "Season after season, Rizzoli & Isles continues to deliver ratings. It has proven to be a solid, enduring hit. We are delighted to offer consumers another season of this remarkable show." In addition to Harmon and Alexander, the series stars Jordan Bridges (Rushlights, Mona Lisa Smile) as Frankie Rizzoli Jr., Jane's younger brother and a Boston patrol officer who is following in her footsteps as a detective; Lee Thompson Young (FlashForward) as Jane's partner, the computer savvy but squeamish Detective Barry Frost; Brian Goodman (Revenge) as Lieutenant Detective Sean Cavanaugh, whose knowledge of the hardscrabble back alleys of Boston and history as a detective make him the perfect choice to head the Homicide unit; with Bruce McGill (Law Abiding Citizen) as the seasoned and lovable Detective Vince Korsak, Rizzoli's former partner who was initially hurt to find Jane partnered with Frost; and Lorraine Bracco (The Sopranos) as Jane's nosy but warm-hearted mother, Angela Rizzoli, who moved into Maura's guesthouse after her recent divorce and works at the coffee shop inside the Boston Police Department. Rizzoli & Isles is produced for TNT by Hurdler Productions and Ostar Productions in association with Warner Horizon Television. The series is executive produced by Janet Tamaro, Bill Haber (TNT's Nightmares & Dreamscapes: From the Stories of Stephen King), and Michael Katleman (Memphis Beat, Life on Mars). *	Building Boston - Transforming Los Angeles into Boston is no small task. Viewers will enjoy a virtual visit to the set, with the series' production designer as their guide. *	Rizzoli & Isles: When Truth Meets Fiction- Executive Producer Janet Tamaro's past as a reporter helps create plot lines that feel authentic. This documentary offers viewers insight into how the series takes facts and applies them to the fiction.